Samsung’s latest Galaxy S5 was globally launched this month with a plenty of new features. Fingerprint sensor and water resistance were two definitely getting the most eyeballs. However, following the breaking news of hackers being able to get into Samsung Galaxy S5 with a faux fingerprint, here comes the reports of users finding the Galaxy S5 water resistance tech failing on them. Samsung Galaxy S5 was released with an IP67 water resistance certification. According to the Korean giant, you can keep your latest flagship smartphone submerged into around 3.2 feet water for up to 30 minutes. 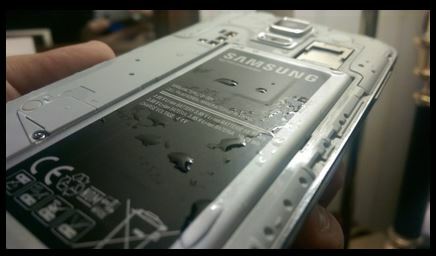 Later, we also saw Galaxy S5 water resistance tests which proved the smartphone to be even sturdier than earlier thought as the SGS5 stayed in for a good hour with no damage. However, the latest user reports claims that Samsung Galaxy S5 leaks water and is unable to sustain the 3.2 feet deep water for the prescribed maximum time. So before you also feel adventurous and try drowning your smartphone, please to cover your battery securely along with the USB port to not get into any issues later on. Samsung has just received its first post-launch software update weighing some 28MB carrying the usual tag of improved performance. The new software update build is G900W8VLU1AND running on the Android 4.4.2 KitKat. 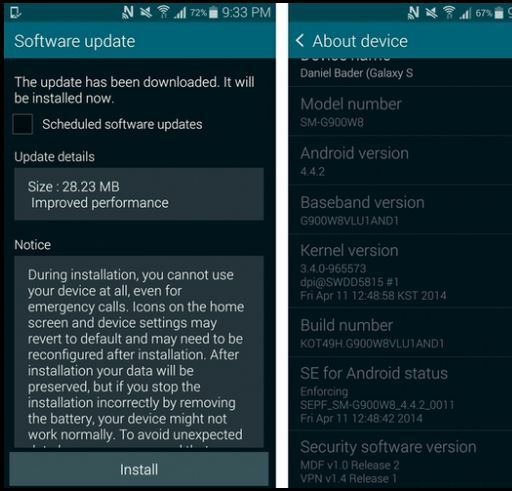 You can update your Samsung Galaxy S5 to this latest software update from settings. Ensure to charge your smartphone to at least 50% before you go ahead with the update installation. Unflod Baby Panda” iOS Malware Detected on Jailbroken Devices! Samsung Galaxy S5 Fingerprint Sensor Hacked, PayPal Still Confident!